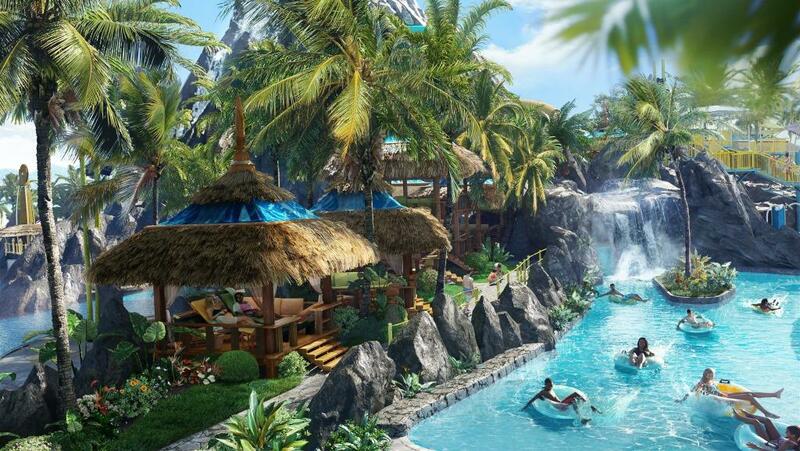 Live the carefree island life at Universal’s Volcano Bay ™. 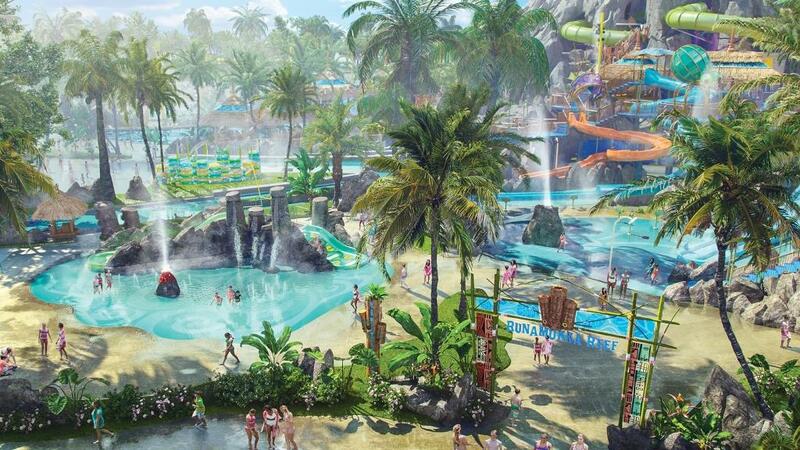 It’s an all-new water theme park like no other filled with thrills, indulgence and rejuvenation. No standing in long lines, wrestling with tubes, or waiting for the fun to begin. 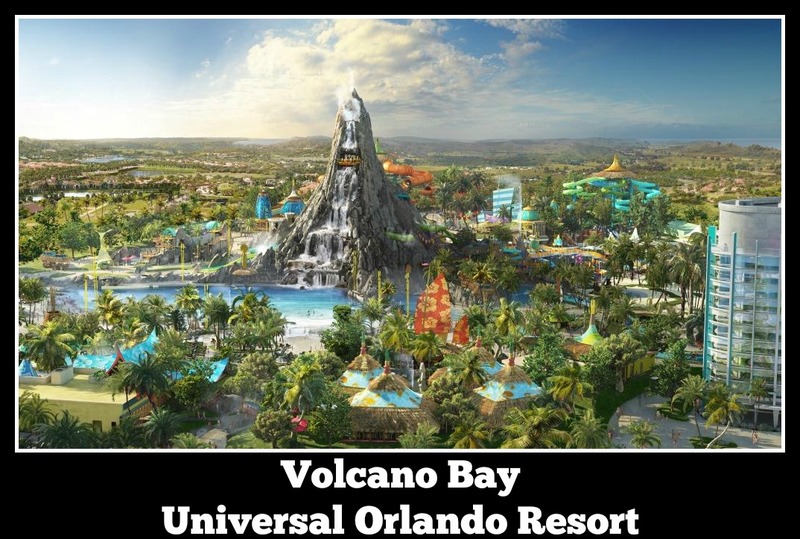 It’s a tropical paradise just steps away from everything Universal Orlando Resort™ has to offer. 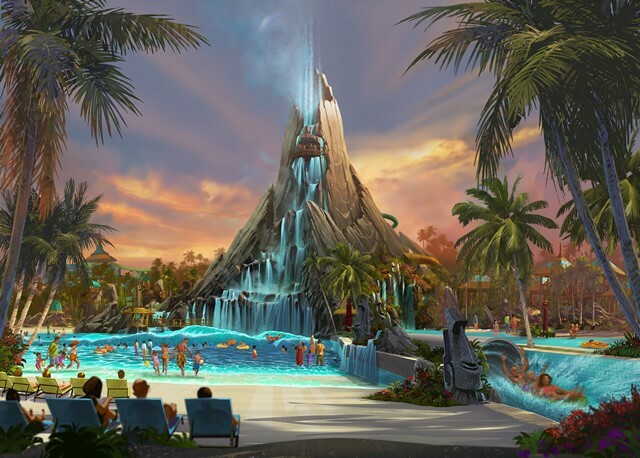 TeAwa The Fearless River – Up for an adventure at Volcano Bay? Take a thrilling whitewater ride along TeAwa The Fearless River. Race along a roaring, watery onslaught of churning rapids and choppy waves hanging tight to your inner tube. Ko’kiri Body Plunge – Join in the centuries-old tradition of honoring the volcano god, Vol, by braving the incredible Ko’okiri Body Plunge. Featuring a 70-degree fall through a drop door and 125 feet of screaming, white-knuckle fun, this dizzying descent ends with a watery tribute from Vol himself. Must be 48″ tall to ride. Kala and Tai Nui Serpentine Body Slides – Join Kala and Tai Nui where sea and sky meet and take a leap of faith from high atop the volcano. Twin drop doors simultaneously plunge two guests down clear, intertwining tubes before sending them joyfully splashing into the turquoise waters below. Must be 48″ tall to ride. Ohyah Drop Slide – Test your mettle and get into the Waturi spirit by tackling the Ohyah Drop Slide. Ascend the side of a cliff before plummeting down the twisting waters of Ohyah before dropping out four feet above the pool below. Must be 48” tall to ride. Ohno Drop Slide – To achieve even greater bragging rights, brave the rope bridge and plunge down Ohno, a serpentine adventure that ends six feet above the pool below. Be sure to yell your battle cry on the way down. Must be 48″ tall to ride. Honu– Experience the twists and turns of underwater currents just like Honu, the sea turtle. Hang on tight as the raft sweeps up two massive walls, through ocean mists and down into sparkling pools in this thrilling adventure. Must be 48” tall to ride. Waturi Beach – Locals know the surf’s always up at Waturi Beach. Swim, splash and relax right along with them in the sparkling waters and warm waves of this sparkling lagoon at the foot of mighty Krakatau™. Punga Racers – A favorite among Waturi children of all ages, Punga Racers send single riders on their manta ray mats sliding down four lanes through underwater sea caves. 42″- 48″ tall must be accompanied by a Supervising Companion. Maku Round Raft Ride – Brave the watery twists and turns of Maku. Riders slide through a deep volcanic gorge before spinning wildly around bowl-like formations. Geysers shoot water everywhere before a watery vortex pulls riders through more wild, twisting curves. 42″- 48″ tall must be accompanied by a Supervising Companion. Puihi Round Raft Ride – Test your bravery as your six-person raft careens through a dark, winding tunnel before it explodes out into a massive funnel formation. You’ll feel the stomach-flipping thrill of a zero-gravity hang time before splashing your way to safety at the bottom. 42″- 48″ tall must be accompanied by a Supervising Companion. Taniwha Tubes – There’s a place where the puka trees grow abnormally tall. Inspired by their twisting roots, the Waturi built four twisting water slides called the Taniwha Tubes. Riders can try all four twisting tracks, but beware—mischievous tiki statues spray jets of water when you least expect it. 42″- 48″ tall must be accompanied by a Supervising Companion. ika Moana – Ride the waves like the ancient Waturi did, twisting and turning along the waterway. Ika Moana, the whale, joyfully sprays water from his blowhole before everyone splashes down together in the waters below. 42″- 48″ tall must be accompanied by a Supervising Companion. Tot Tiki Reef – Even the youngest Waturi can get in on the fun in the shallows of Tot Tiki Reef at Volcano Bay. Play among splashy slides, a tot-sized water volcano and a family of friendly tikis with spraying fountains. Plus, adorable whales spray and sing as kids raise and lower their hands. Maximum of 48”. Runamukka Reef – Once an exotic coral reef beneath the ocean, Runamukka Reef is now a favorite play place for young Waturi children with its bubbling geysers, water guns, slides and dump cups. Shaded by fanciful bamboo sea creatures and waving seaweed, it’s the most playful spot in Universal’s Volcano Bay™. Maximum of 48”. 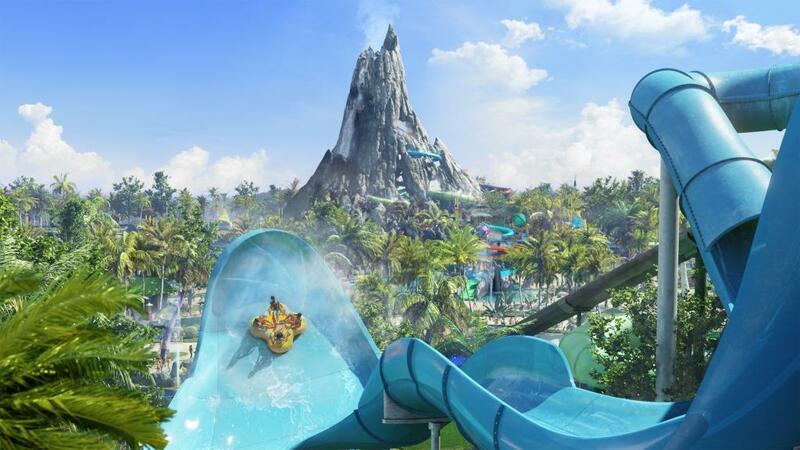 Kopiko Wai Winding River – Take a slow ride on the Kopiko Wai Winding River through the tropical landscape of Universal’s Volcano Bay ™, a land full of surprises. Sprays of water surprise along the way, and beneath the lava rocks, Stargazer’s Cavern reveals the magical night sky above. Puka Uli Lagoon – This pool features multiple elements that even the tiniest Waturi can enjoy like bongo drums and spraying water. The Reef – Watch the bravest Waturi take the Ko’okiri Body Plunge from the comfort of this peaceful leisure pool. Its clear plexi tube shoots straight through this 5.5-foot-deep pool, which features its own private waterfall that’s perfect for frolicking. Cabanas – From drifting leisurely down a winding river to reconnecting with family, this tropical paradise is filled with opportunities for relaxing indulgence. Additional fees apply.